Recently we were asked to do some kite demonstrations for a private company. It was a catering company who were to take over at Southsea Castle in Portsmouth. They had chosen the name of “The Big Yellow Kite Company” because it made them think of laid back summer days and a general feeling of good times – fair enough – I’d go along with that! The corporate colours were yellow and black – perfect for us to finish the day with by ‘saying goodbye’ with our theme tune and flying yellow/black kites with matching tails! But the thought struck me, why had they not asked if we had a big yellow kite? We had as standard size one – “The Ascension” – which I had reviewed in the Corner a couple of issues back but we needed something big and my immediate thoughts turned to a Morgan Mega Delta. Whilst this was going on I mentioned that we had ordered a new kite which was going to be something a bit special to some of our newer friends who were very much in to kites but only for the last couple of years or so. I’ve been here before – there are a lot of names that I am used to but are not as well known these days because they simply don’t seem come to the fore – you will see some of them mentioned in other articles – we owe a lot to those guys and gals who were around when we started. Some of the names and characters are still about of course – respect! Well for others that don’t know, Paul is that gentle giant with the shock of black hair who sits quietly at the back of the Skybums tent with his wife Helene at lots of festivals up and down the country. He never bothers those that walk in but always answers any questions in full with his deep, dark brown voice and smiling all the time. Former art students (Paul studied Graphic Design and Illustration and Helene studied Fashion and Textile Design) the pair got into kites in a time honoured way after buying their then two year old son a kite on a trip to the beach back in 1982. Their son flew for a while then went off to play in the sand but they carried on flying the kite all day The following morning they went off to buy another and thus they became hooked! Over the next couple of years they started to build their own kites from plans in books and then by making variations. After a while they started designing their own. 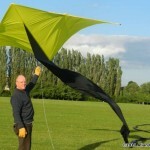 Eventually they started making kites for friends and other kite fliers and in 1986 started Morgan kites. All summer they went round festivals (most were just starting up) and at the first Bristol met Andy King from the Kite Store in London. He asked if they could supply kites to them which they did. Early the following year they were asked if they would produce a Delta and a Para foil, based on the sizes in Mark Cottrell’s book “Low Level Aerial Photography”. The 12 foot Mega Delta was born with the telltale stripes running to the rear of the kite and has since been used for Aerial Photography, lifting aerials for radio hams, lures for birds of prey and – the inevitable parachuting teddy bears! This large delta flies in a wide range of winds and is very stable requiring around 200lb breaking strain line. Other sizes are now produced, some smaller at 6 feet and 8 feet wingspan for lifting smaller loads to be more manageable but also larger 15, 18 and 20 feet. Variations from these have also been produced. Even in the early days a Sled section was added to increase the 12 foot wingspan up to 15 feet and, again, this was a very stable, strong pulling kite. A 20 foot version has been used for high altitude flying. The Avon kite fliers asked if the Morgans would produce some branded 12 foot flow tail deltas. This was done but because there were so many versions on the market they didn’t want to follow the crowd in having the same thing as a stock item. They played around with a few ideas and eventually came up with the extended keel version of the Mega Delta. Instead of having a standard keel they tapered it back to 26m giving a different look in the sky. Once again other sizes are produced but this is the most popular. After looking through their catalogue on line, it was this kite that interested Marilyn and I the most and the opportunity to have it made in our team colours was irresistible! 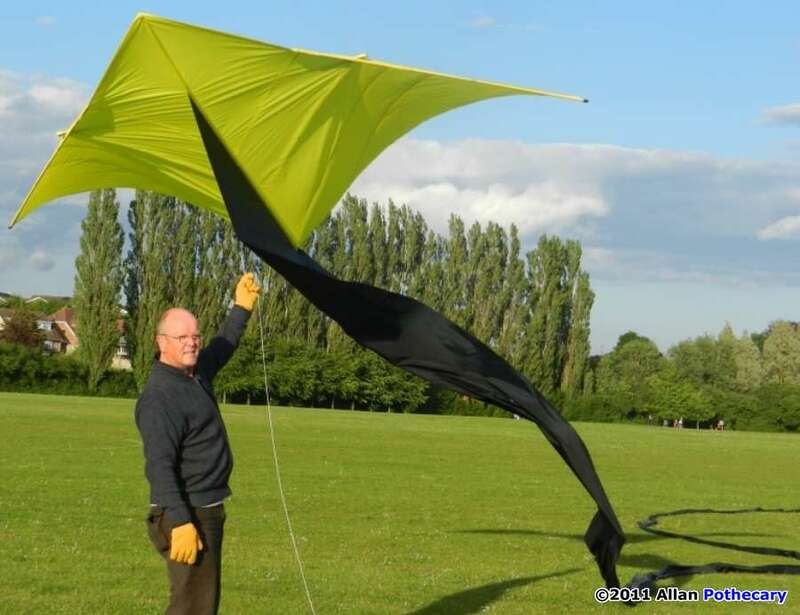 After seeing it in the strong and gusty winds at Swindon and after having suffered several breakages with other kites there I was keen to have ours made using glass fibre in the main, stress bearing parts of the frame. This added a little to the weight and to the cost but on the day proved to be a wise investment. Paul showed us a fail safe device he uses to help protect the rods from breaking. Instead of securing the sail to the rods, he had introduced a loop of line which passed through a tag on the sail and over the arrow knock. 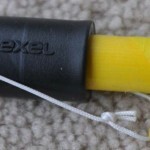 Then if the kite did get caught up with another in the sky and performed a nose dive to the ground the line would break on impact as the pole flexed and save form breakage in much the same way as Velcro is used on sport kites. I can say that we did manage to test this when we were setting up at Southsea in a very bad swirling gust – and it worked! Even for one who does not do fiddly, a new line was easily tied and the kite relaunched on time! Paul and Helene have been making kites professionally for 25 years this year and now go under the name of Sky Bums after opening their shop in 1992. Like most kite businesses it proved not viable to run commercial premises but Paul and Helene now work successfully from home and make all their kites themselves. They continue to design and build kites for the discerning kite flyer and have a great range of interesting and novel kites and artefacts available straight off the shelf. These guys are a valuable asset to the kiting world and can be found at a kite festival, somewhere, most weekends throughout the summer. Their website is skybums.com and they can be contacted on David Hathaway or by phone on 01939 234486. Next time you are at a UK festival pop in to their tent for a chat – tell them you saw this article as a starter and ask to see some of their more unusual exclusive designs. This entry was posted in 2011, Issue 79 (Jul/Aug), KL Archive and tagged paul morgan.